The clog silhouette is back, and so is Crocs with an updated, elevated style with all of the comfort you’d expect. This edition is made with Croslite™ material uppers, so they’re incredibly light and easy. The suede strap and metal buckle are a nice finishing touch. 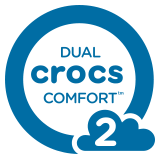 Inside, you get Dual Crocs Comfort™ — a Croslite™ foam footbed for all-day cushion on top of a shock-absorbing PU outsole. The 65-mm height gives you just enough lift without compromising your comfort. Simple, on-trend and of course, comfortable. What else would you expect from Crocs?